Explodes in a cross shape. 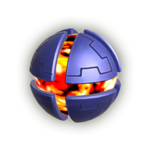 The X Bomb (called a Cross Bomb in Japan) is an item from the Kid Icarus title, Kid Icarus: Uprising. It appears as an explosive item in Super Smash Bros. for Nintendo 3DS / Wii U and Super Smash Bros. Ultimate. Upon detonation, the bomb explodes in two lines of flames that span across the stage in either an X-shaped or cross-shaped formation. The explosion does not hurt the players or their team if they throw it. If they activate it with other means, however, the bomb hits everyone. Bowser Jr.'s Final Smash, Shadow Mario, paints an X over the screen to harm other players in a nearly identical fashion to this item's function. Masahiro Sakurai stated on Nintendo's Miiverse network that the X Bomb is from Kid Icarus: Uprising, and is not to be confused with an item of the same name from Meteos. Though the design for the X Bomb in the game is definitely based off Kid Icarus: Uprising, it actually behaves more like its Meteos equivalent. It is further confusing to note that the Japanese name for the X Bomb, Cross Bomb, is actually the name of an item in Meteos, and the name is completely irrelevant to Kid Icarus. 3DS Kid Icarus: Uprising (03/2012) This bomb will explode shortly after it leaves your hand, expanding outward in an X-shaped blast that tears through anything in its path. Its incredible power can be a lot of fun, but don't get crazy. Blowing up everything is no way to get ahead in life! This page was last edited on January 10, 2019, at 21:08.